Several months ago I purchased a “Pocket Hose” to try the expandable hose out and see if it would be something I wanted for the boat. A 50 foot hose that can fit in your hand seemed like a great idea. 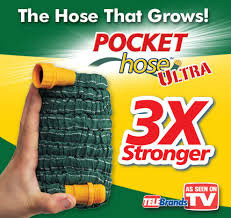 The “Pocket Hose” has a clear expandable membrane wrapped by a green canvass material and has yellow plastic connectors. The expandable membrane and green canvas held up fine over the 8 days I had this hose before it sprung a leak. The issue was with the yellow plastic connections. After 8 days a small leak formed where the hose met the connector. By day 9 the hose was unusable and it was returned for another hose. The second hose didn’t last 5 days before forming another leak in the same spot where the plastic connector affixes to the hose. This time I trashed the hose and gave up on the expandable hose idea. The hose itself was fine enough to hold up for at least a few months, maybe a year. The real downfall of this product is the connection. They basically have a metal hose clamp over the thin expandable membrane attaching the hose to the connector. After several expand and deflate cycles the metal hose clamp appears to form tears in the expandable membrane causing initial leaks and complete failure. After a few months my disgust with the expandable hose subsided and I purchased another expandable hose. This time I decided to spend some money and opted for the “Xhose PRO”. After 2 months of daily usage this hose is living up to the hype. I ordered 2x 25’ hoses and keep them connected constantly and water my lawn daily. So far there have been zero leaks. The outer canvass material is holding up well after being dragged across the ground daily. I’m not sure how the hose is connected to the brass fittings, but it is significantly better. The only reason I found out last time was after complete failure of the second “Pocket Hose” I stripped it apart to see what the problem was. The “Xhose PRO” is an all around better constructed product. I currently have the two 25’ hoses. When we leave for cruising we will have two 50’ sections on board. These durable lightweight hoses will be great for having water onboard. I used both hoses daily watering my grass and dragging the hose over grass, concrete and rocky terrain and around objects. After each use I would let all the water leave the hose allowing it to compress back to the small size. If you’re in the market for an expandable hose, I would spend the money for the DAP Xhose PRO. It is an easy to use sturdy product that I expect to get years of use from. Well wouldn't you know it. 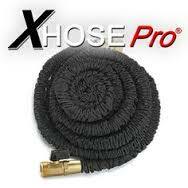 Soon after I write a positive review of the XHosePro, it springs a leak. While watering the grass the hose caught a loose nail and snagged while I was moving around the yard. Before I could release the tension on the hose the nail punctured the outer canvass and inner tube. The inner hose separated and deflated. The good news was, the design of this hose allows for repair. You can't repair the inner tube, but you can re-attach the inner tube to the brass connector easily. The brass fitting comes apart with the help of a couple wrenches. There is a plastic expandable clamp that holds the tube onto the connector. This can be pried down the inner tube and the inner tube can then be taken off the brass fitting. I then attached the good portion of the hose to both brass fittings and have another working hose. It is about half the length as the nail puncture was near the center of the hose but it is still fully functional, albeit a little shorter. The hose still seems to hold up well and the fact that it can be repaired with no extra parts is a great design feature. Hopefully I won't have any protruding nails around the boat to destroy the hose, so I expect to get a lot of life out of the XHosePro.